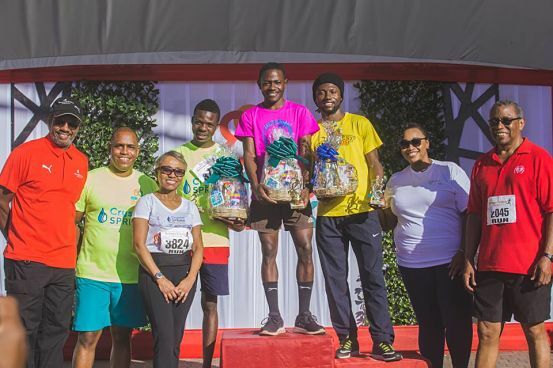 STRONG FINISH: Male 5K winner Henry Thomas (centre) and his runners-up (Kemar Leslie and David Pusey) share a candid shot with event sponsors. 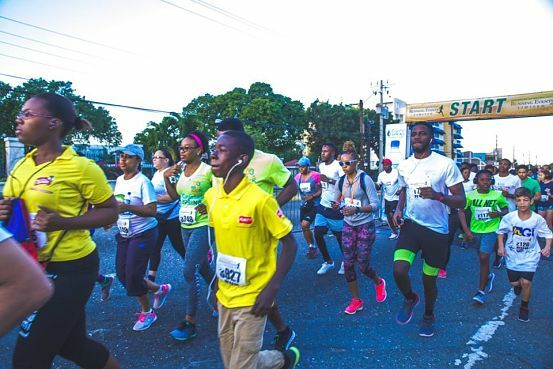 FOR Romario Samuels, brand manager of Crystal Spring, the biggest reward that has come with their debut as title sponsors of the Run for Your Heart 5K is the nearly 50 percent increase in the number of persons participating. 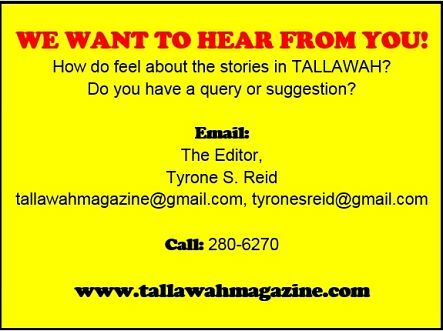 “We had over 1,200 persons registering and coming out to do the run and the walk, and that’s about a 45 percent increase in the numbers,” he tells TALLAWAH inside New Kingston’s Emancipation Park on Sunday morning, as the day’s activities slipped into high gear. Now in its third year, the 5K Run/Walk, the brainchild and major fundraiser of the Heart Foundation of Jamaica (HFJ), has always received sponsorship support from the spring water company, but 2019 marks their very first outing as title sponsors. And according to Samuels, the extra effort put into the planning and preparation, coupled with financial investment, has paid off. In addition to Crystal Spring, this year’s raft of sponsors include (among others) Purity, Foska Oats, Sun City Radio and Mountain Peak, all of whom set up booths inside the park, attracting scores of fitness enthusiasts.